I have recently revised and reprinted my book “Colours from Nature”. It has 11 extra full colour pages with many more photos and it has a coiled (spiral) binding so it will lie flat for ease of use and an acetate outer cover to protect it from splashes. 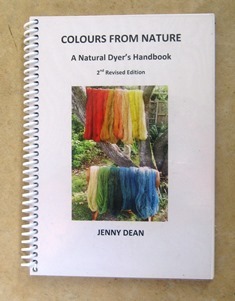 I feel this revised edition of “Colours from Nature” most closely represents my current dyeing practice and the dyes and methods I use personally. It is also the book I use as a text book with my students at Ditchling Museum. This entry was posted on Sunday, August 5th, 2018 at 11:38 pm and is filed under Diary & News. You can follow any responses to this entry through the RSS 2.0 feed. Both comments and pings are currently closed.